All foods and herbs should be first purified to clean them and enhance the potency. It is the transformation process of all herbs and foods which is essential for safe and effective use. No point of taking ‘super foods’ in high quantity and quality if it is not prepared the right way. Even one highly medicinal herb in Ayurveda, if not purified specifically by boiling it in milk, will cause cancer. Most simple and common purification method is washing with water. Soak in salt water for about 20mins, then pour out the black water (impurities). Then it is ready to be cooked. Eggplant can also be roasted to counter the Slimy quality. Can aggravate skin conditions like eczema and psoriasis as well as joint issues like rheumatoid arthritis. I will let you in on a secret. 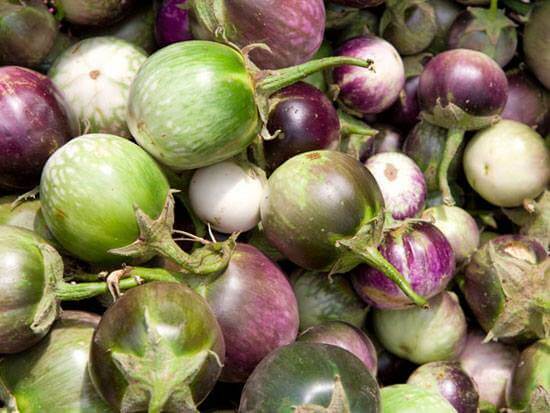 The more tender, smaller, younger the eggplant, the more medicinal. This prevents the vegetable from developing the doshas (energies in the vegetable that causes vitiation in the body tissues). Often people at the markets leave the smaller eggplants behind! photo: my favourite type of Eggplant. Field to Feast, NSW grows and sells them with a lot of love, thus promotes positive microbiology in the food simply through loving and positive organic farming! (1) Environmental Working Group, “Shopper’s Guide to Pesticides in Produce,” 2011 edition.